Na Nach is a group of Breslev Chasidim following the teachings of Rabbi Yisroel Dov Odeser. With a strong focus on spreading joy and the books of Rebbe Nachman, Nanachs can be found traveling throughout Israel in colorful vans, blasting music and dancing in the streets. Easily distinguishable by their large white Na Nach Kipas, Nanachs are a common scene all over the country. Powerful teachings and anarchistic beliefs have made Na Nach a growing movement amongst the youth of Israel. Saba, Rebbe Yisroel Dov Ber Odesser (1888 - 1994) the original founder of the Na Nach movement, was a fifth generation Breslov Chassid and a student of Rebbe Yisroel Karduner. Originally a Karlin Chassid, Yisroel Dov Odesser came across the book Hishtapchus Hanefesh. After reading the book and later meeting Rabbi Karduner, he openly accepted the path of Rebbe Nachman of Breslov despite great opposition from his family and community. Yisroel Dov Odeser remained a disciple under Rabbi Karduner for five years until his mentor passed away during a plague in Tiberias. In July 1922 at the age of 33, Rabbi Yisroel Odesser claimed to have received a miraculous note from Rebbe Nachman of Breslov who had passed away 112 years earlier. This note is commonly referred to as the 'Petek'. On a superficial level the Petek was nothing more then a letter of encouragement. According to Rabbi Odeser however, it contained much deeper meanings. In the Petek, Rebbe Nachman of Breslov signed his name in a most unusual quadrupled kablistic format; Na Nach Nachma Nachman Muman. Members of the Na Nach group claim that the phrase Na Nach Nachma Nachman Muman is the Song of Redemption mentioned in the Tikunay Zohar and Likutay Maharan. Kabbalistic tradition reveals the existence of ten songs throughout the history of mankind. Nine of the ten have already been used while one song remains for the purpose of redeeming the Jewish Nation from the final exile. It is a strong belief amongst the Na Nachs that just uttering, singing or chanting this phrase can bring about healing and salvation. They claim that it is a very powerful concentration that condenses all the spiritual teachings and energies into one little sentence. For many years Rabbi Yisroel Dov Odeser kept the existence of the Petek a secret from all but his closest family and friends. Finally in 1982 after reached a point where he completely understood the Petek and all its deeper meanings, Rabbi Yisroel Dov Odeser decided that it was time for it to be revealed to the world. He gathered around him a group of Israeli and American Balei Teshuva and some French Sephardi Rabbis. Along with his new followers Rabbi Yisroel Odeser started a campaign to spread the song Na Nach Nachma Nachman Muman and the teachings of Rebbe Nachman of Breslev all over Israel. Members of the Na Nach group strongly believe in the authority of Rabbi Odesser and consider him the sole transmitter of the Breslov tradition in this generation. Rabbi Odeser is often referred to as 'the Saba', literally 'the grandfather' due to his old age. Rabbi Odesser himself promoted usage of this name, instead of being called a rabbi. This was done in spirit of the Breslov tradition of avoiding honor and fame. Na Nachs interpret the passage from the Petek "And with this I will reveal to you a secret and it is: Full and heaped up from one extreme to another extreme (PTPTYH)" as a holy command to spread the song of Na Nach and the Breslov teachings all over the world. Hafatza is the word used by Nanachs to describe these outreach and distribution activities. Nanachs place a lot of emphasis on Hafatza and consider it one of the most important elements in their lives. There are many Na Nach's that spend the bulk of their day doing Hafatza. These Nanachs are called Mafitizim, literally 'the ones that spread'. Much self sacrifice is need from an individual and his family to become a full time Mafitz. Mafitizim and their families often have to go with little or no income since most Hafatza is done on a volunteer basis. Nanach Mafitizim often live in conditions of poverty in order to fulfill what they believe is important. Additionally many Mafitizm leave their families for the majority of the week, coming home only for weekends. Na Nach Mafitzim are very strong in their beliefs and are willing to make these great sacrifices to live what they consider the truth. Although not every Na Nach is a full time Mafitz, almost everyone takes part in some form of Hafatza. Long before Hafatza became popular, the Saba predicted that one day there would be vans roaming across Israel to spread the Breslov teachings. Rabbi Yisroel Ber Odesser instructed his followers to dance at traffic lights with blasting music and announce to the world that Rebbe Nachman exists. Eventually his students did get hold of vans and went to carry out his words. Na Nach vans are the most common form of Hafatza known to the general Israeli population. Na Nach vans travel throughout all the major cities in Israel playing Nanach music and selling the books of Rebbe Nachman of Breslev. 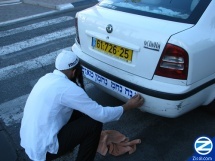 Most vans are covered with large colorful stickers portraying the Saba and the phrase Na Nach Nachma Nachman Muman. Vans are normally equipped with two large speakers on the top of the vehicle and a stockpile of Breslev books, Nanach stickers, music and parifinalia in the back. Often the Na Nachs will jump out of their van at red traffic lights to do a quick dance before the cars start driving again. When they get a chance, Nanach Mafitizim park their van, turn on music and set up a folding table with their inventory. Nanach Mafitizm will then dance until stopped by a passerby interested in buying a book or learning more about Rebbe Nachman. Many times local residents join the action. Dancing can sometimes grow to dozens of bystanders. With respect to Rebbe Nachman's strict views of modesty, woman are strongly encouraged not to join the dancing. Na Nach dancing is often freeform, where each Mafitz dances individually using random moves and motions. On average there are between 8 - 20 active Na Nach vans and many smaller cars. Most Na Nachs that own a car will cover it with Na Nach stickers and do some Hafatza as move about their day to day activities. Na Nach vans can contain a single Mafitz or as many as 13. Most vans average a team of 4-5 Mafitzim. Life on the Na Nach van can be rough, Mafitzim often work on very little food and sleep. Most Mafitzim spend hours dancing each day, sometimes for a few hours in a row. Most Hafatza vans stay on the road for the bulk of the week, with the Mafitzim sleeping in the van itself or at designated Na Nach resting spots. Besides dancing on busy streets, many Hafatza teams will visit events and weddings as well. It has already become a tradition amongst secular Israelis to invite Nanachs and bring joy to their weddings. Saba once said "whoever wants to be my friend should do bayit bayit", go house to house spreading Na Nach, the Petek and teachings of Rebbe Nachman. Many Mafitizim practice this teaching and take off a few hours a week knocking door to door trying to spread the books of Rebbe Nachman. Aside from the vans there are Na Nach stores located throughout Israel. Almost all the stores are run and operated by Keren Rebbe Yisroel Odesser. These stores are generally small, often nothing more then a booth. Amongst Na Nachs they are referred to as 'bastas'. Na Nach stores often sell non Nanach products as well to help cover the rent and raise money for additional printing of books. Meron hosts the largest operation. Keren Rebbe Yisroel Odesser runs two large booths right at the entrance of Rebbe Shimon bar Yochi's Kever. There are a number of other store locations including Jerusalem, Hebron and Safed. In addition to the stores, Mafitizm will often set up makeshift tables at events expected to have a large turnout. It has become practically impossible to walk around Israel and not come across Nanach Stickers. From street poles and traffic signs to store fronts and car bumpers, Na Nach stickers have made their mark all over the country. Popular even by non believers of the Petek, Na Nach sticker have infiltrated every group in Israeli society. Traditional Nanach stickers simply contain the phrase Na Nach Nach Nachma Nachman Muman against a colored background. Over time hundreds if not thousands of unique Nanach stickers have been printed using different designs, shapes and printing methods. Some Na Nach stickers are small enough to fit the back of a cell phone and others can be couple of feet long. There is no particular group or person responsible for the stickers, practically every Na Nach will at some point in his career tried to print a Nanach sticker. Most sticker designs only last a single printing run before they go extinct. Stickers are cheap to buy and are the most popular selling Na Nach product. This probably contributed to their widespread distribution. Stickers stay in place for a while and may remain in the same location for years after being hung up. Aside from stickers there are a number of other Na Nach products being produced. These include Na Nach Kipas, scarves, baseball caps, hats, t-shirts, sweat shirts and key chains. Like many other groups the Na Nachs have developed their own music. There are many types of Na Nach music created by different artists. Some Nanach artists have succeeded in having their music penetrate even traditional Orthodox Judaism. Many Na Nach songs include a chanting of the phrase Na Nach Nachma Nachman Muman and are based on the teachings of Rebbe Nachman of Breslev. A common type of Na Nach music is Nanach Trance, where recorded statements of the Saba are dubbed against a background of techno music. Nanach graffiti is a common site around Israel and is more then an act of juvenile delinquency. It is the mark of the Na Nach group trying to infuse their teachings upon the nation. Na Nach graffiti is very controversial and one of the main arguments people have against Na Nach. Not every Na Nach supports the use of graffiti to spread the Song of Redemption but many do. Rabbi Odesser himself said that painting Na Nach can only be done with the owners permission. A debate rages amongst Na Nachs about what is permissible and what is not. All Na Nachs agree that it prohibited to spray paint private property, although occasionally an over enthusiastic newcomer might get caught up in his zeal and violate this rule. There is also a general agreement amongst Nanachs that it is acceptable to spray paint on abandoned property such as a ruin. Na Nachs claim that each time a person sees the graffiti and is reminded of Na Nach, it is the biggest favor that can be done for him and far outweighs any negative elements involved. A sticky part of the debate revolves around the issue of 'national property'. Many Na Nachs claim that this is forbidden and doing so might even violate Halacha. A minority argue that since Rebbe Nachman is the King of Israel, all 'national property' belongs to him. These Nanachs feel justified spray painting his name on what they believe to be Rebbe Nachman's property. There is no official dress code in Nanach but a large percentage of its members wear a Na Nach Kipa and every last one dons a Kemea. Na Nachs generally have an untrimmed beard and long payos. Many Na Nachs prefer to wear their payos all out and wild, there are others that keep them curled in a more traditional Hasidic fashion. Based on the opinion of the Kabbalah almost all Nanachs have large untrimmed beards. Na Nachs tend to dress loosely sometimes mimicking hippy styles. Just like other groups in Breslov, Nanachs wear Radzyin Techalis on their Tzitzis. On Shabbos some Na Nachs wear a shtreimel with Yerushalmi yellow blue striped caftans. Others wear white as is customary according to the Kabbalah and practiced by Rebbe Nachman himself. Many but not all Nanachs wear large white Yarmulkes embroidered with the phrase Na Nach Nachma Nachman Muman, typically referred to as Na Nach Kipas. It is an ancient Kablistic custom to wear a white Yarmulke and Rebbe Nachman's personal Kipa somewhat resembles the modern Nanach Kipa. Nanach Kipas can be purchased for a few dollars and have become a very popular Purim costume in the Charadi world. Traditional Nanach Kipas are white with black letters, they have also been produced in a number of other colors. Following instructions of the Sabba the Na Nachs have created a 'Kemea' or protective amulet. A Kemea is generally worn around the neck and contains the phrase Na Nach Nachma Nachman Muman written on parchment alongside a small copy of the petek. Inside the Kemea there is a double wrapping to make its entry into the bathroom permissible. Many designs of the Kemea have been manufactured using a variety of materials including leather, plastic and wood. More expensive silver Kemeas are also available and are generally given as a gift for large donations. Amongst the Nanachs there is strong belief in the power of the Kemea and many have supernatural tales to tell over regarding its effects. Some Na Nachs wear two Kemeas, following a teaching of the Saba that two is better then one. Leadership is a position frowned upon by the Na Nachs. Since the death of Rabbi Yisroel Ber Odesser in 1994 there has not been any leader the movement answers up to. There are a number of sub groups within Nanach, although for the most part they share similar outlooks. Na Nachs tend to have an individualist personality and value personal independence. Many Na Nachs will not conform to any group and live as interests them at that moment. Due to the strong emphasis Na Nachs place on Hafatza most groups contain a publishing arm dedicated to the printing of Breslev books. Aside from the main Nanach publishers, many books and pamphlets are printed by individual Nanachs. Unlike other groups in Breslov, Nanachs focus more on publishing actual works of Rebbe Nachman and not personal compilations. Keren Rebbe Yisroel Odesser is the largest publisher of Breslov Books in the world, having distributed and sold millions of copies. The Keren was initially founded by Rabbi Yisroel Ber Odeser himself. After he passed away Saba left a will stating that his grandson Amram Horowitz be placed in charge of the Keren. Many Na Nachs took the will as a direct command from the Saba that all Hafatza was supposed to go directly through Amram. Others argued that there was room for other Hafatza to take place. Amram Horowitz passed away in 2009 and left his two sons Shmuel and Nachman in charge of the Keren. Shmuel and Nachman Horowitz were also mentioned in the original will of the Saba as two of the three caretakers of the Keren. Over time the Keren has become more then just a book publisher. Keren Rebbe Yisroel currently runs a number of schools, stores and Hafatza operations. Although not all Mafitzim subjugate themselves to the Keren, the bulk will work alongside them and distribute their books. After a bitter disagreement with the Keren regarding the printing of the Petek and Na Nach on published books, a number of French devotees separated and began their own Hafatza activities. French Mafitizm tend to emphasis the spreading of Saba over the teachings of Rebbe Nachman. Their publishing company is currently called 'Nekuda Tova'. A large public annual party in Jerusalem during the Hillulah of the Saba, is also run by French Nanachs. Recent years have shown an active growth of Na Nach amongst Americans. Most American Nanachs live in Safed and generally do Hafatza alongside Israeli Nanachs. Occasionally American Nanachs do Hafatza activities on their own. There is at least one Nanach van that is completely American. Internet based Hafatza is largely dominated by American Nanachs. NaNach.net is a prime example of this effort. Shir Chadash is a Na Nach outreach organization run by Yitzchok Benzonson. Benzonson became a devote of the Saba during the last week of Rabbi Odesser's life. Shir Chadash is based in Tel Aviv and aims to make secular Israelis religious by spreading Na Nach teachings on an intellectual level. Shir Chadash publishes a number of books compiled by Yitzchok Benzonson. To fully understand the mind of a Na Nach one has to first understand the teachings of Rebbe Nachman of Breslov. Na Nachs are very devoted followers of Rebbe Nachman and try to integrate his teachings and advice deep into their lives. Common Na Nach practices include Mikva, Hisbodedute and adherence to Halacha. Na Nach is not a new form of Judaism and it does nothing to change Halacha. Na Nachs claim that all other groups in Judaism have their worship of G-D tainted with desire for money and honor while they themselves have the truth. In short the underlying principal of Na Nachs ideology is; Rebbe Nachman must be accepted by everyone and is also the solution for everything. Acourding to the Nanachs Rebbe Nachman's teachings must be spread at any cost. It is a common belief amongst the Na Nachs that Rebbe Yisroel Dov Odesser was the Tzadik of the last generation and was the sole true transmitter of Rebbe Nachman's teachings. Na Nachs are very opposed to other Breslov leaders and accuse them of pirating Rebbe Nachman's light for their personal honor. It is generally accepted in the modern world of Orthodox Judaism that any person who is well learnt in Torah and has reached some spiritual level is considered a Tzadik. Na Nachs however have much higher expectations from a person before he can be given the title Tzadik. Rebbe Nachman Teaches that only a person that has completely nullified all his inner bad is entitled to lead the masses. Nanachs consider any Rabbi that has not reached this high level to be a false leader. In Na Nach terminology such a false leader is called a 'Mefursam shel Sheker'. Most current accepted Rabbis are considered by the Na Nachs to be Mefursamim. When it comes to Halacha Na Nachs are not as extreme and will ask Halachic questions to any knowledgeable Rabbi. Other then this Na Nachs are known to avoid any association with Rabbis. Nanachs claim that any person with fame must use his influence to spread Rebbe Nachman's teachings, this and only this. According to Nanach philosophy there is no room for any Rabbi or leader to place himself in middle of this picture or claim that he can help people come closer to G-D. Rabbi Nachman of Breslov is buried in Uman, Ukraine and each year tens of thousands flock to his grave site. Although Rebbe Nachman himself requested that he be buried in Uman, Na Nachs claim that his intent was only on a temporary basis. Na Nachs quote passages from his books indicating that Rebbe Nachman's long term will was to eventually be reburied in Israel. A number of attempts have been made by Na Nachs to move Rebbe Nachman's body to Israel, some of them while the Saba was still alive. Not everyone agrees to the move and a number of the leading Breslev Rabbis strongly enforce his remain in Uman. A pamphlet entitled 'Bey Rebbe' has been published by the Na Nachs that contains a rebuttal to any opposition to move the body. As is customary by Breslover Chasidim, the majority of Nanachs travel to Uman each year for the holiday of Rosh Hashanah. There is a minority of Nanachs that insist they can get this Tikkun by staying in Jerusalem and visiting the grave of the Saba. Beliefs of these Nanachs are rooted in their opinion that the Saba is a reincarnation of Rebbe Nachman himself. Na Nachs are scattered all over Israel with a concentration in the cities of Safed and Ramat Bet Shemesh. There is also a fledging Nanach Yishuv called Ebay Hanachal located in the Israeli territories. Current Na Nach population is estimated at 400 families and a few hundred single men. Na Nachs make their presents very noticeable despite being a minor percent of the general Israeli population. An average bystander watching unemployed Na Nachs dancing in the streets is fast to assume that he is dealing with drug and alcohol abuse. In truth Na Nachs shun the use of drugs and alcohol and attribute their joy and happiness to the advice of Rebbe Nachman. How they dance for hours on end, no one knows but it is not from the use of drugs. Rabbi Yisroel Odesser was very against the usage of drugs and once exclaimed that it is worse then adultery. Rebbe Nachman was known to be very against unnecessary drinking. Na Nach is a free entry group and for some new recruits it might take a little time to completely drop old habits but this is the exception rather then the rule. Na Nach is generally accepted as part of day to day life in Israel. Most people are happy to see the Na Nach van coming down the street bringing joy and dancing. There are occasional complaints about the loud music and every Mafitz had some encounters with angry pedestrians and policemen. Secular Israelis, normally opposed to the religious are friendly to Na Nachs and do not feel them to be a threat to their ideology. Many youth and Bali Teshuvah have found spiritual inspiration with the Na Nachs and the teachings they spread. Most Orthodox Religious people mock the Na Nachs and consider them an entertaining joke. They are startled to real life when occasionally one of their own children runs off and joins the 'cult'. Just cutting the deadlines, the Nanachs applied for the registration of their new political party 'Kulanu Chaverim - Na Nach' to run in the 19th Knesset elections. Kulanu Chaverim means 'we are all friends', a reference to the Nanach ideology of equivalence amongst all those following the Tzadik. The Na Nach swipe is a hand gesture involving a downward movement of the hand while using the fingers to spell out the letters Nun and Ches. In total, the Na Nach swipe consist of two steps. A first step creates the letter Nun from 'Na' and a second step creates the letters Nun and Ches, forming the subsequent part of the phrase Na Nach. Initially the initiate closes his hand, leaving open only the thumb and index finger, forming a script version of the Hebrew letter Nun. He then swipes down his hand, at the same time also opening his middle finger, causing the letter Ches to be formed in between the two base fingers. Originally developed by Simcha Hachman 'NaaNaach', the Nanach swipe has spread across Israel and other parts of the world as the unofficial Na Nach greeting. Nanachs can often be seen swiping each other from far away as a greeting method.